My friend recently purchased a Sog Pentagon Elite Knife.I thought he was crazy for wanting a military or law-enforcement grade knife around the house. Then he showed me the knife and I discovered it has plenty of uses around the house. This is a knife which looks online like it has a double blade. It doesn’t. It also looks as if it could be illegal in about 20 states. It’s not. It does have a super sharp point but the serrated edges will cut through twine, wire or stubborn plastic. It disengages with one finger and can be used so many ways it belongs on every tool belt. My friend loves it. It is easy to use and he doesn’t have to pry out the blade as he used on on his other knife. He can cut open boxes with it or snip wires if he is doing work around the house. 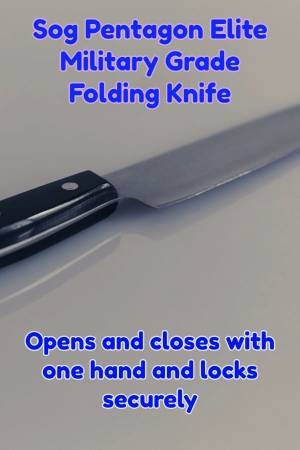 It may be so well made that the military uses it, but it really is an affordable and very useful knife to have around the house or the workshop. For a quality knife that does it all, my friend wasn’t crazy getting this one.